To Everything There Is A Season: A Bridge Unbroken Book Review and eBook Giveaway! Mrs. Pedersen is the winner! I have emailed her to let her know. Thank you all for stopping by! This book was a great surprise for me to read. The author is new to me so I was excited to see how she wrote! This book reminded me a lot of Katie Ganshert's Wildflowers from Winter but with it's own unique twist. The plot is similar, Dakota returns to her hometown and tries to avoid a man from her past. Meanwhile, she is running from a mysterious someone who the reader does not completely understand "who" until the last part of the book. I really enjoyed the setting and the characters. I thought the romance was a bit rushed but I loved how I didn't know what was really going on with Dakota's past. The book is very well written and I highly recommend!! I am excited to read more from this author. Fans of Katie Ganshert will enjoy this book. I am hosting an eBook giveaway on my blog for one of my readers. Enter through the rafflecopter below. Cathy: (enters and moves to seat) Hey, you two. Y'all ready to get this interview underway? Chance: (with a smirk and a sideways glance exchanged with Dakota) Of course. Why wouldn't we be? Dakota: (her green eyes shooting daggers) Yeah, it's not like we have anything else to do with our time, thanks to you. Cathy: (shifting in her chair uncomfortably) Uh...what do you mean? Dakota: Renovate a farmhouse, rebuild a farm, fix a bridge, work on our relationship, get away from the antagonist, all while dealing with an unexpected gift of farm animals and a dog? I mean, really, couldn't you just send us to outer space in a defunct space shuttle or something? Chance: (reaches over and pats Dakota's arm) Easy, honey, your Irish temper is showing. Cathy: (swallows hard and glances down at her notes) Um, sorry. First question: Why did you two introduce yourselves to me with such major problems to overcome? Chance: Ha! That's not the way I see it. You're the one who created us, not the other way around. Why'd you make us with such problems to overcome? Cathy: Because I wanted to explore the topic of forgiveness. It's such a huge part of our faith, but all believers tend to struggle with it, especially when the offender seems unconcerned and determined to destroy us, you know? Chance: Okay, so maybe it's a little bigger than that. Chance: (with an exasperated sigh) Okay, beam. You happy now? Cathy: (staring at the clock) Wow, time really does fly fast when you're having fun. Better move on to question two. Dakota, why do you have the tendency to run away? Dakota: (crosses arms, a glare on her face) Well, as I recall, you gave me a pretty tough childhood. (inserts sarcasm) Let me express my undying gratitude. Cathy: (smiling) You're very welcome. Anything to help the story. Chance: Yeah, speaking of that, why do you put the story above your own characters? Don't we deserve some gratitude for bowing to your commands? Cathy: Um, first of all, you are the story; the story is you. That's just the way it works. And as for bowing to my commands? Well, let's just say that both of you are two of the most unruly characters I've ever written. You took over on more than one occasion and told the story for me. Dakota: I would think you'd be grateful. Cathy: If I wrote by the seat of my pants, maybe. But I like knowing what you guys are gonna do before I ever start writing the story. Dakota: Great. Our author has OCD. Chance: Big time. But at least it explains why she put us through so much. Cathy: Enough about me. Chance, would you explain to my reader friends how you got those scars on your face? Dakota: (still looking at Chance, with a compassionate expression) Uh, I'll take responsibility for that. Sorry, Chance. Chance: (smiling tenderly at Dakota) It's over and done with. Besides, I gave you a few scars as well. Chance: (brings her hand to his lips and plants a soft kiss there) Agreed. (He stands and pulls Dakota up with him.) Interview over. Cathy: (her face incredulous) What? But I'm not through. Dakota: (glancing back over her shoulder) Seriously, Cathy, how can you expect to write a romance and not give your hero and heroine some alone time? I mean, really. Cathy: (watches them walk away, then produces a sheepish grin) Sorry. Did I mention that these two characters don't always do what I say? (sighs and waves good-bye) Thanks for coming to the interview. A frightened runaway wants her painful past to disappear. A plan to start afresh is derailed when she co-inherits her late grandfather’s farm with the man responsible for the scars on her heart. But he isn’t the only ghost from the past. Someone else is out to get her and will stop at nothing to get what he wants. Will Chance and Dakota lay aside their grudges to restore the old farmhouse and bridge, or will evil forces sabotage their attempt at forgiveness? Enter the grand prize drawing for the $100 Visa Card now by clicking one of the links below. But hurry, because the contest ends May 22, 2014. (NOTE: Some contest tasks can be completed daily for extra chances to win.) The grand prize winner will be announced at the A Bridge Unbroken Facebook launch party on May 22. I'd love to be entered to win an ebook! This one has been on my radar for a while. I've got the others, read all but book 3, and am excited to read this one. I would love to know more about Dakota and Chance. I love Cathy's books! 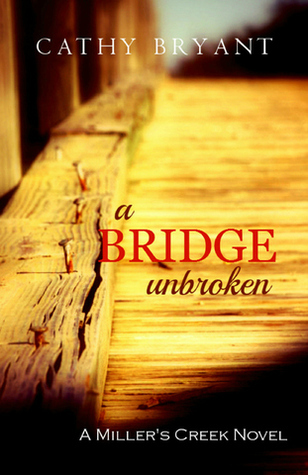 I look forward to A Bridge Unbroken, restoration of houses and people are a favorite theme. Thanks! Aww, thanks Merry! I love the theme of restoration, too. It's a perfect picture of what God does with us. :) Thank you for stopping by!